"Teach your baby to count with this ... board book story about hibernating hedgehogs from the creator of Hairy Maclary and Friends." --Publisher information. Teach your baby to count with this delightful board book story about hibernating hedgehogs from the creator of Hairy Maclary and Friends.It's winter, and the garden is full of sleeping hedgehogs.All is peaceful now, but what will happen when they wake up in spring? 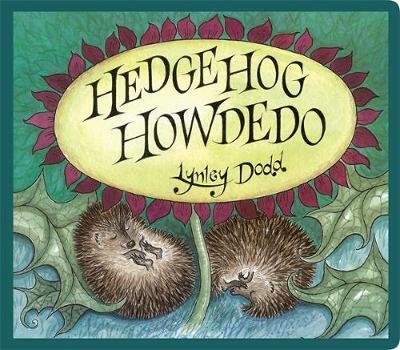 Dame Lynley Dodd is the author and illustrator of the much-loved Hairy Maclary and Friends series, as well as numerous other best-selling children's stories. She published Hairy Maclary from Donaldson's Dairy in 1983 and has gone on to write and illustrate a further 20 stories in the series, including stories based around some of Hairy Maclary's canine friends and feline foes - Slinky Malinki, Schnitzel von Krumm, Scarface Claw, and a duckling called Zachary Quack. Lynley lives in Tauranga, New Zealand. When asked which of her books she most enjoyed working on, she replied, I really enjoyed doing the illustrating for books like Find Me a Tiger, The Other Ark, Sniff-Snuff-Snap! and The Dudgeon is Coming because there was more scope for imagination in the different animals and settings, as well as things like animal camouflage to explore.